If we listen and work in concert, lives with our animals can be even better! Listening, watching, and following their lead helps me help others. The animals can be our greatest teachers. These are our stories. The wonderful thing about working with animals is there is always a chance to begin again, to build on what has been done and hold the potential for an even better future. The same is true with this blog. It is time to grow and evolve - and to get busy writing. There will definitely be some bumps in the road, but I'm excited about making this an important part of my overall plans for the future. I will eventually link this and my website (www.connectionsttouch.com) together and plan for each to complement the other. It may take a few weeks, but I'm so excited about it all. Until then, a gratuitous Carson photo. It's been forever since we wrote a blog post, but that doesn't mean we haven't been busy. I attended my fourth Tellington TTouch class in Pflugerville, Texas, in early June. And, I leave on Friday for my fifth class - at the beautiful Icelandic Horse Farm in Vernon, British Columbia. Since I can now work with paying clients, I have a business name - All Creatures TTouch - and, as of this morning, my own website, All Creatures TTouch Behavior & Training. The website is definitely under construction, but I hope to have basic information available in the very near future. The dogs are healthy and happy. The week I returned from my Texas training, I drove to Kansas to collect a new rescue girl, picked up as a stray in the western part of the state. 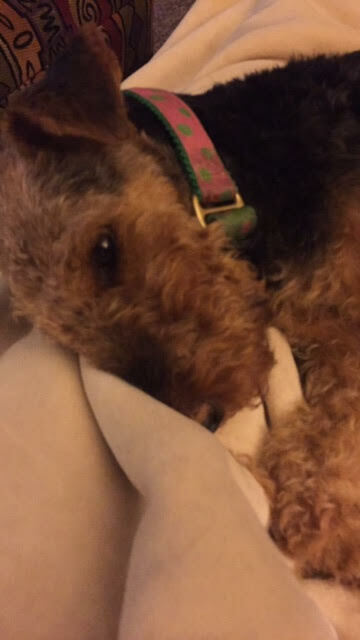 I cannot thank Airedale rescue volunteers enough for helping with transport, vetting, and grooming of this little one, named Joan Jett (JJ) in honor of the little town where she was found, Jetmore. JJ has been with us for a month now and is slowly coming around. She is extremely timid and untrained in all manner of living with humans - using a leash, pottying outside, walking through doorways and on varying indoor surfaces. I'm thankful to be available to work with her this summer, to help her learn confidence and to embrace the world around her. It's a slow process, but she is teaching me, too - as have so many wonderful canine teachers - to go slowly, with presence and with an open heart. As Ram Dass says, "Be here now." She is learning and then we backslide and then we learn again. One of my teachers and mentors, Kathy Cascade, sums it up like this: "It's about moments, not minutes." So JJ and I try to focus on the moments. 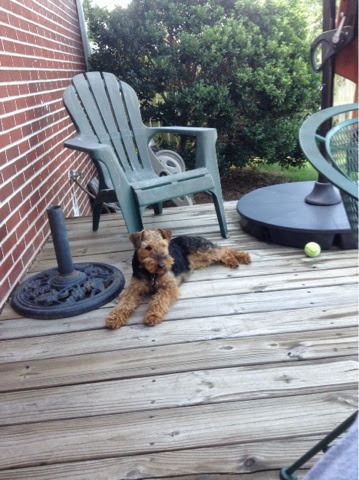 JJ is listed on the national Welsh Terrier rescue website, WTCARES. She will stay here with me a while longer, but soon she will be ready for her own loving forever home. The dogs and I thank you for reading our infrequent ramblings and for being our friends. We are grateful for your physical and your online place in our lives and in our hearts. And so I leave you with a couple of photos from our recent mornings outdoors. Oklahoma weather is being kind to us this summer. We have had more than a few mornings of absolute coolness and beauty in the midst of what is normally stifling temperatures 24 hours a day this time of year. This poem hangs in my office. One day I will find a framed copy but, for now, it is typed and taped to my wall. I found my eyes searching for it this morning as I walked in, and now have read it several times. It resonates today. Thank you, Mr. Berry. Your words are balm for my heart and soul today. Last fall, I wrote a post about our all-too-short time with the animals in our lives. At the time, my parents' little terrier-mix had begun having seizures and coughing at any exertion. For a brief while, Sandy improved but, a week ago, the seizure frequency increased, she became frightened rather than shaking off each episode, and she could no longer control bodily functions as she seized. It was time, and she told my mom in no uncertain terms. Mom said she felt at peace after she made the call to the vet. She, Sandy and my dad spent a lovely weekend together. The weather was good, I cut up steak in small chunks so her very few teeth could chew. Mom fixed her lots of scrambled eggs with cheese. They snuggled on the sofa and in their favorite chairs, with Mom massaging her for hours on end. I took some pictures on Sunday and will have one framed for Mom to keep. When Monday morning came my dad, who was scheduled to go to the vet with Mom and Sandy, needed to go to the doctor.. So, I went instead. I used some lavender essential oil, as Sandy had had a couple of severe seizures overnight. I also began Reiki, as she was shaking almost uncontrollably, a habit that began about 18 months ago, and continued it throughout the next hour. We both stayed with her and our vets - family friends we have known forever - were in tears, too. Sandy was most calm. Her eyes, always huge and brown, were calm as I held her. Her shaking was absolutely gone for the first time in months. She looked in my eyes the entire time the anesthesia was taking effect and she simply went to sleep. Once the second injection was administered, her heart stopped almost immediately. It was tired. It was time. We planned to lay Sandy to rest in my parents' backyard, where she could keep watch over the neighborhood cats. But, a family friend who helps them a lot in the yard and house offered to take her to his home in the country and lay her to rest with all his animals. She is now among many friends and I know she is also sticking close to Mom, as she has mentioned hearing her footsteps coming up the stairs several times this week. Thank you, Sandy. You were a beautiful little companion. The hole you left is huge. Keep watch over Mom and Dad and visit when you can. You are missed. A fun day in the barn! I mentioned last week that we planned to attend our first barn hunt over the weekend. We did and it was so much fun! I should have packed the car Friday night. I didn't and that meant getting up early to get everything loaded - crates, treats, water, bowls, leashes, harnesses, towels, first aid kits. The dogs definitely have more stuff than the humans! We hit the road just before 7 a.m. Carson, of course, sat up for the entire drive, watching me intently with her little black eyes. Marley was calm and quiet from his position at the rear of the Outback. We arrived just in time for the judges seminar, where we learned the specifics and all the dogs were introduced to the rats - both in cages and in the tubes used during the actual hunts. Both Marley and Carson went nuts over the rats; it was hard to lower their intensity once they saw and smelled them. I ran each of the dogs twice in the introductory event (RATN), which was allowed since it was a fun match and no ribbons were being awarded. Marley was one of the first dogs "up," and he was promptly disqualified for marking a hay bale. Oops! Carson didn't find the rat first time out either but, honestly, in both cases handler error (me!) was more to blame than anything else. In barn hunts, as opposed to earthdog trials, you can actually talk to your dog. Once I got the hang of that, both dogs did a much better job. They found the rats the second time around and had a blast doing it! They didn't have to climb or tunnel at the intro level, just release them and find the tube with the rat in it within 60 seconds. Four other terriers and their humans were there. We have known one another for years and had a great time. Carson works the rat after choosing the right tube! 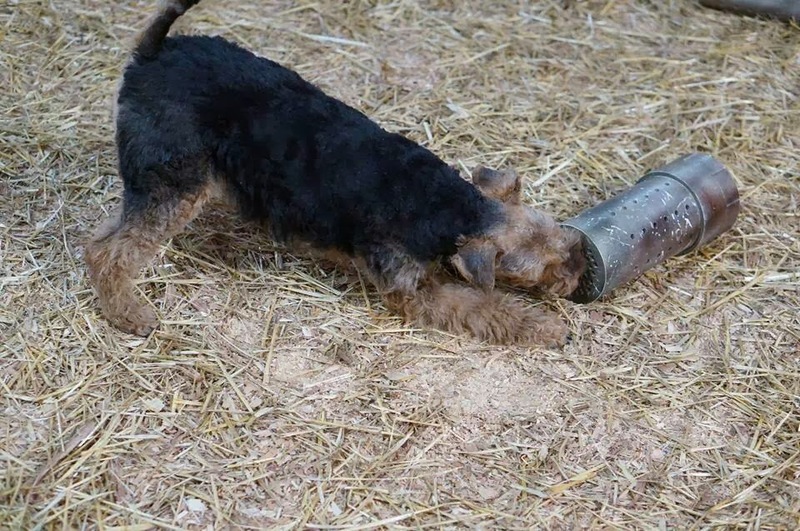 Barn hunts are open to dogs of all breeds and sizes. Besides our six terriers, there was a cocker spaniel, a boxer, two Rhodesian Ridgebacks, dalmatian, wire-haired dachshund, and several other breeds. Perfect way to spend a brisk Saturday morning. Carson and Marley slept most of the rest of the day. 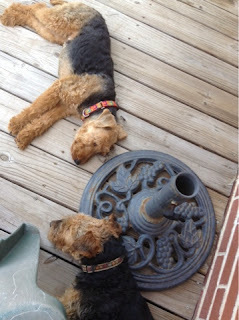 I guess all that barking and jumping wore them out. I know it did me! Yesterday we had the day off from school AND the weather was nice. That meant it was time to do some serious terrier grooming. After all, we will attend our first-ever barn hunt this weekend in Edmond (OK). I have never considered myself anything more than an almost-adequate groomer - and some would disagree with even that description! But we made it through with lots of terrier coat gone and no scrapes or blood loss. All in all, that's a pretty good day. Marley was up first. His coat has never been the best. For one thing, to say he is double-coated would be an exaggeration! And his furnishings? Geez, they are super-thin. Then came Little Miss Carson. She is famous for sitting down when I want her to stand and it's no different on the grooming table! Most striking is how different it is to groom her from Marley. I've never done them back-to-back before, so those differences were much more apparent. 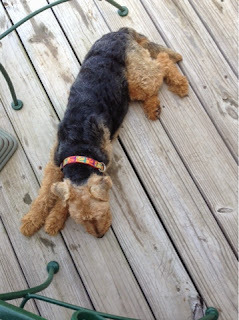 Her coat is classic Welsh double-thick, sometimes making it a challenge to even get the clippers through. Wiry, thick, hard - and sticks to everything it touches when trimmed - that's what you get when you groom Carson! The photo on the left is before we started and on the right is nearly done. Faces and furnishing are tough for me and I trim both more than what is done for the show ring. But it helps keep her a bit cleaner when playing in the yard or slinging water all over the kitchen. Copyright 2013, Paula Joseph-Johnson/Following Paw Prints. Simple theme. Powered by Blogger.